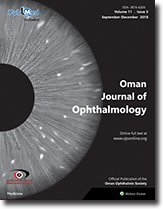 Aims: To analyze the outcome of combined scleral buckling and phacoemulsification for primary rhegmatogenous retinal detachment and visually significant cataract. Settings and Design: Retrospective, interventional case series. 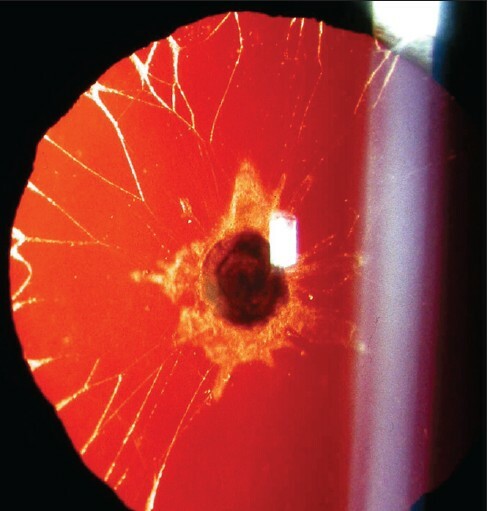 Materials and Methods: Retrospective review of patients with primary rhegmatogenous detachment with or without proliferative vitreoretinopathy (PVR) changes and visually significant cataract who underwent combined scleral buckling and phacoemulsification with or without intraocular lens (IOL) implantation between 1991 and 2006. Of the ten eyes, all underwent phacoemulsification and five eyes had posterior chamber Intraocular lens (PC IOL) implantation. All eyes underwent scleral buckling with solid silicone explant combined with #240 encircling band. Subretinal fluid (SRF) drainage was done in five eyes Results: Four eyes improved to better than 6/12 at a mean follow-up of 9 months. Anatomical success was achieved in all eyes (100%). Conclusion: Combined scleral buckling and phacoemulsification is a safe and effective procedure that spares the patient the burden of repeated surgeries. It may be considered as a treatment option in selected cases of rhegmatogenous retinal detachment with significant cataract with/without early PVR. Background: The integration of the contact lens (CL) practice with the VISION 2020 initiative is important. We assessed the facilities at the private CL clinics of Muscat. Accordingly, we suggested the appropriate eye care for CL wearers in Oman. Study Design: This was a descriptive study. Materials and Methods: This study was conducted between May and July 2006. A team of optometrists and health inspectors visited clinics and collected information about the infrastructure, available human resources, and materials used in the CL practice. We used a pre-tested close-ended questionnaire to collect responses of the practitioners and observations of the field staff. Statistical Method: Univariate parametric type of analysis. Results: The team visited 67 CL clinics and interviewed 75 CL practitioners. Proper hand washing facility was available at 61 clinics. Thirty-nine practitioners had >10 years of experience in dispensing contact lenses. Only 13 clinics had a bio-microscope. None of the clinics had legal documents signed by both providers and end users of the contact lens. Conclusions: Contact lens has received less attention in areas outside the developed world. The CL practice in the private sectors of Oman needs to be strengthened. Minimum standards, standard operating procedures for CL practice, and its periodic supervision would be useful. Purpose: The limbus and its stem cells are very important in the pathogenesis of pterygium. 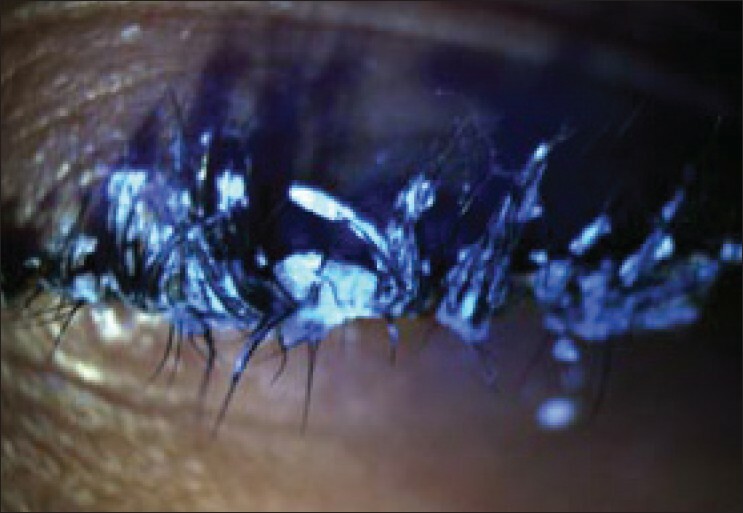 In this study, the efficacy of limbal stem cells and conjunctival autograft transplantation for the treatment of primary pterygium will be assessed. Design: Prospective noncomparative cohort study. Materials and Methods: Forty-two eyes of 42 patients with grade I-III primary pterygium were included in the study. Pterygium excision was performed followed by superotemporal limbal stem cells and conjunctival autograft transplantation in all cases. 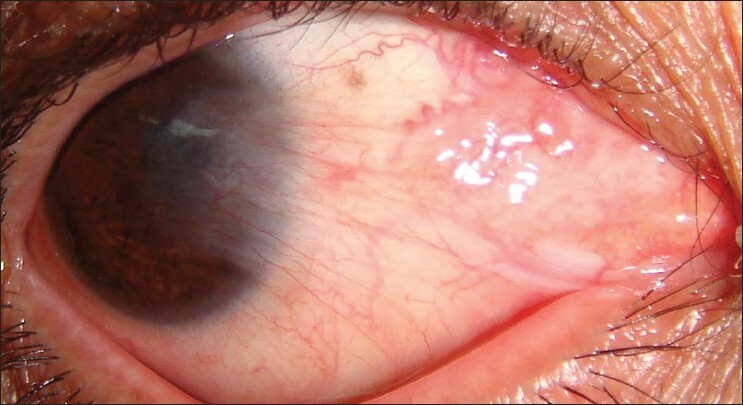 Recurrence of pterygium and complications within a mean follow-up period of 18.26 months (10-28 months) was studied. 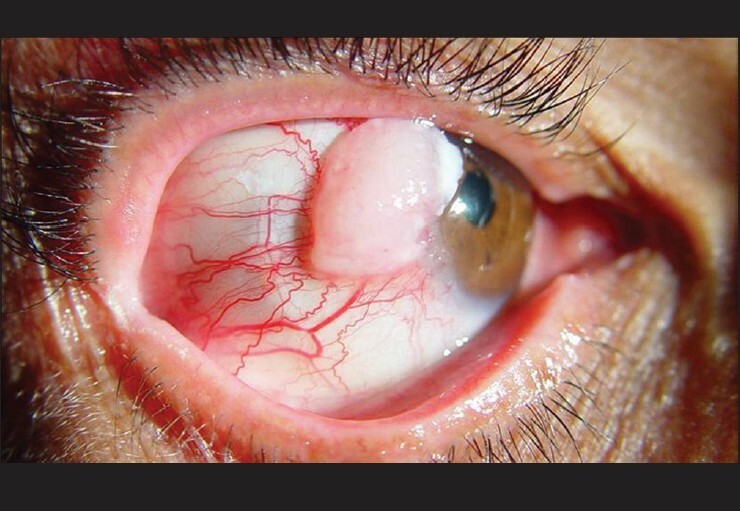 Results: Recurrence of pterygium occurred in two eyes (2/42; 4.75%). No significant complications were noted. Apart from re-operation in the two recurrent cases, no further surgical interventions were needed in any case. Conclusions: Limbal stem cells and conjunctival autograft transplantation is a safe and effective technique for the treatment of different grades of pterygium. It is very useful in preventing pterygium recurrence, which is a major problem in pterygium surgery. 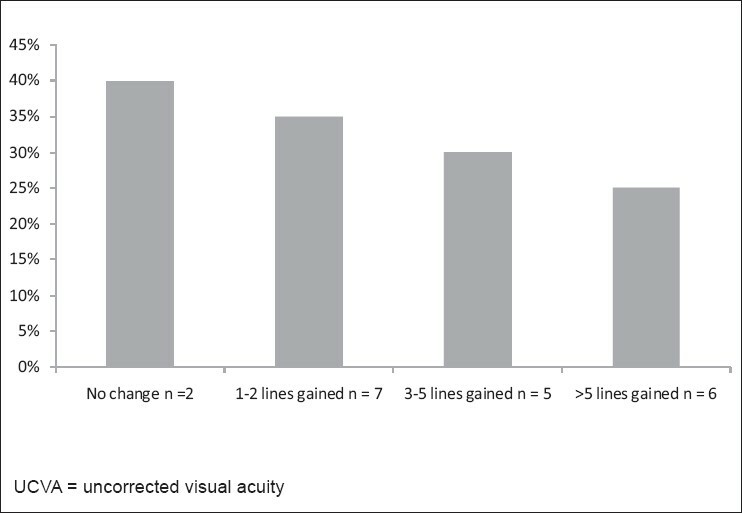 Aims: To compare long-term variability (LTV) in short-wavelength automated perimetry (SWAP) with that of standard white-on-white (W-W) perimetry, in primary open angle glaucoma (POAG) patients and normal subjects and to determine its clinical significance. Patients and Methods: The sample comprised 30 patients of stable POAG (group 1) and 20 age-matched normal controls (group2) who performed both SWAP and W-W perimetry thrice at monthly intervals. Long-term variability at each location in the visual field was calculated as the standard deviation of three threshold decibel values taken from the three visual fields performed. Mean LTV was then calculated for the entire field for each subgroup and compared. Results: Mean LTV in SWAP and W-W perimetry in glaucoma patients was 3.01 ± 0.74 dB and 2.73 ± 1.07dB respectively. 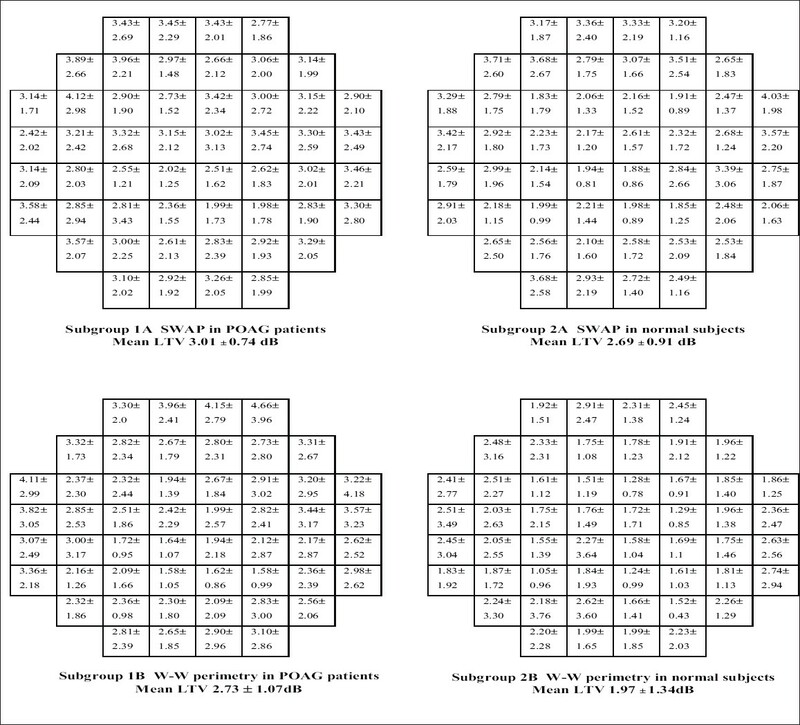 In normal subjects mean LTV of SWAP and W-W perimetry was 2.69 ± 0.91 db and 1.97 ± 1.34 dB respectively. Intra group analysis revealed that mean LTV of SWAP was greater compared to W-W perimetry in normal subjects and glaucoma patients. In the latter, the difference did not reach statistical significance. Inter group analysis showed that mean LTV in both SWAP and W-W perimetry was greater in glaucoma patients than in normal subjects. Factors other than POAG that could influence LTV, including progression of cataract and change in pupil size due to use of pilocarpine were excluded. Mean examination time for SWAP per sitting was 7.65% longer than that for W-W perimetry. Conclusions: Higher mean LTV of SWAP as compared to W-W perimetry needs to be taken into consideration when evaluating serial visual fields for change. Use of rapid threshold algorithms e.g. SITA (Swedish interactive test algorithm) SWAP should be encouraged as these will reduce the patient fatigue and increase the reliability of the test. Background: The aim of this study is to evaluate the safety and effectiveness of riboflavin-ultraviolet type A (UV-A) light rays induced cross-linking of corneal collagen in improving visual acuity and in stabilizing the progression of keratoconic eyes. The method of corneal cross-linking using riboflavin and UV-A light is technically simple and less invasive than all other therapies proposed for keratoconus. It is the only treatment that treats not only the refractive effects of the condition but the underlying pathophysiology. Materials and Methods: In this prospective, nonrandomized clinical study, 20 eyes of 19 patients with keratoconus were treated by combined riboflavin UV-A collagen cross linking. The eyes were saturated with riboflavin solution and were subjected for 30 min under UV-A light with a dose parameter of 3 mW/cm 2 . 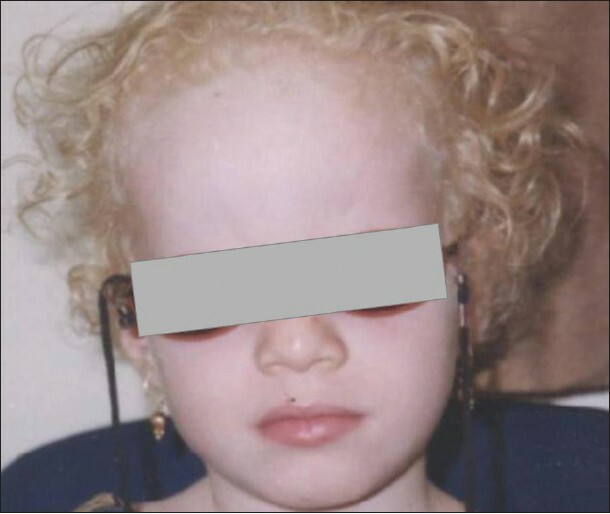 Safety and effectiveness of the treatment was assessed by measuring the uncorrected visual acuity, best corrected visual acuity, manifest cylinder/sphere, keratometry, pachymetry, posterior and anterior elevations from Pentacam and corneal aberrations at 6 months and 1 year post-treatment. Results: Comparative analysis of the pre-operative and 1 year post-operative evaluation showed a mean gain of 4.15 lines of UCVA ( P = 0.001) and 1.65 lines of BCVA ( P = 0.002). The reduction in the average keratometry reading was 1.36 D ( P = 0.0004) and 1.4 D ( P = 0.001) at the apex. Manifest refraction sphere showed a mean reduction of 1.26 D ( P = 0.033) and 1.25 D (0.0003) for manifest cylinder. Topo-aberrometric analysis showed improvement in corneal symmetry. Conclusion: Cross-linking was safe and an effective therapeutical option for progressive keratoconus. Cyanoacrylate, also known as superglue, is a polymer which forms a strong bond at room temperature with a variety of materials including metal, glass, plastic, rubber, skin, mucous membranes and other epithelial tissues as well. We hereby present a 22-year-old female who had an accidental instillation of the glue in her eye, with an uneventful outcome.